Luxury bungalow accommodation on Phi Phi Don vary in style and magnificence! The best luxury hotels on the island are of the bungalow style and are located right on the beach. The best luxury resorts on Phi Phi are in three main areas, Laem Tong, Loh Bagao Beach and what is referred to as Phi Phi Don Village. There are no resorts on Phi Phi Ley. 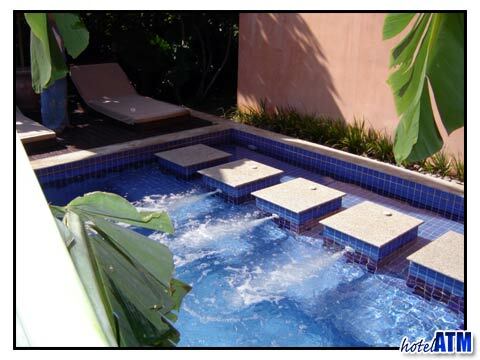 At Laem Tong the Phi Phi five star rated bungalow-villa resort is Zeavola Phi Phi Resort. It's atmosphere of low key, low rise and set amongst the acacia bush the villas themselves get it included in the Small Luxury Hotels of the World accreditation. The luxury villas are almost hidden from each other and it takes a while to learn the maze like route through the acacia from the beach at night. The villa wonderful homely character and large veranda, balcony with mini bar remote blinds, and day beds creates an ideal setting for the honeymoon or romantic escape. The food at the Baxil and Tacada restaurants is truly wonderful and a place to enjoy the best of luxury with Italian, Thai and International cuisine. These restaurants are right on the beach looking out to the islands of Mosquito Bamboo and Koh Jum and the mountainous scenery of Krabi coastline. The pool is set back from the beach but has the elegant straight lines idea for lapping and a decking with day beds ideal for the tan. Diving spot are 8-12 minutes by speedboat down to Phi Phi Ley and Koh Bida and the reefs of Maya Bay. Snorkeling out at Hin Klang just 2 minutes away is the best of all on Phi Phi island. The Zeavola bungalows are considered to be best for luxury on Phi Phi for couples who are looking for an intimate setting. 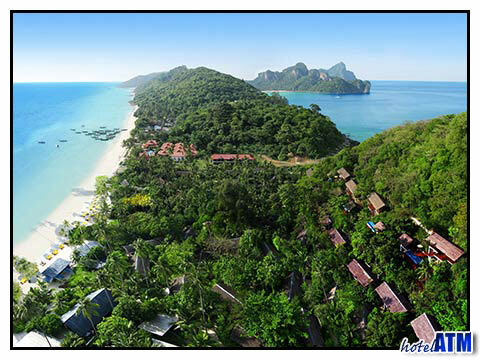 Loh Bagao Beach is home to another special luxury bungalow resort on Phi Phi. This is a resort in a remote area surrounded by the mountains and cliff scenery. Their one hundred plus bungalows are raised on low stilts to allow maximum airflow, line the beach in three rows and are beautifully spaced amongst the coconut grove. The other key to this luxury resort are the island's best facilities, the sole access to a wide remote beach, 2 pools (one is the largest on the island), the tennis courts, a dive and snorkeling center and of course the wonderfully relaxing Wana spa. The three restaurants, 2 bars and a cafe ensure there is plenty of choice and more than enough variations for a weeks a stay. I stayed in one of the deluxe bungalows and I was delighted by it's atmosphere. There are three types of luxury bungalows at the Phi Phi Island Village Resort, the Superior bungalow, the Deluxe bungalow and the Junior Suite Beach Front. The superior bungalow is a traditional bungalow built on stilts and located in the gardens of the resort, 60 meters walking distance from the resorts private beach. The deluxe bungalow, on the other hand is the second row of luxury bungalows behind the the beach front Junior Suite Beach Front. It is no wonder the Phi Phi Island Village Resort is so well reviewed. Holiday Inn Phi Phi Island at Laem Tong can be considered as one of the best luxury bungalows in Phi Phi because of its service and internationally recognized standards. This is a beach front bungalow complex, which many call the perfect hideaway for those who are on their Phi Phi island honeymoon. The sun rise at the beach front bungalows is inspiring. There are a couple of other bungalow resorts with not quite the same luxury finish or facilities and these can used for a pleasurable stay. The interest is not least as they have, in some cases, a lower price tag! Phi Phi The Beach. On the quieter Long Beach, you arrive at reception by Longtail boat and step off into the sand to arrive at a small part of paradise. Right on some of the islands best beach coral reefs and over looking Phi Phi Ley this is worth some research time. All in all, Phi Phi offers a wonderful variety both in nature and in luxury accommodation. The best luxury Bungalows of Phi Phi are your link to heaven on Earth. Written by Philip Russell; Nov 08.